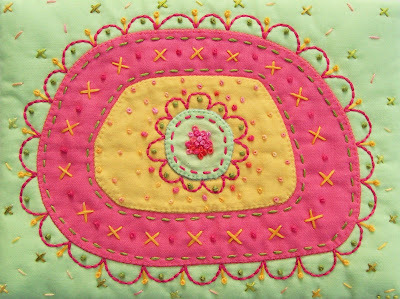 The good news is my flower quilt was one of the featured items in yesterday's "Best of the Week" Etsy Finds Yippee!! You can view each day's Etsy Finds on the Storque, or you can subscribe, (which I do) and receive them via email each day! The bad news is I am still having residual effects from the reaction to the awful antibiotics that I had been prescribed last week. I was starting to think it was my imagination, and kept trying to psych myself out of feeling like crap, but the abdominal cramping, nausea, dizziness, loss of appetite and extreme fatigue keep on hitting me. After doing some more research on my own, I find that I fit the classic symptoms of lingering "secondary" side effects one can get from taking this particular medicine. I just have to wait it out for now, until it leaves my system. (Did you know that a just a dose of over the counter pain medicine stays in your system for 10 days!? ) This has been a huge wake up call to me. From now on I promise to be a stronger advocate for myself, and diligently question, (and educate myself) on the need for any prescribed medicine, and dosage of said medicine. I have always liked my doctor, and actually still do, but any blind faith I had, has been replaced with healthy questioning. Congrats on the featured item! Sorry to hear you're still unwell from the meds. Geez, 10 days remaining in your system? That's scary! Hope you're back to your usual healthy self soon. Feet up & rest! 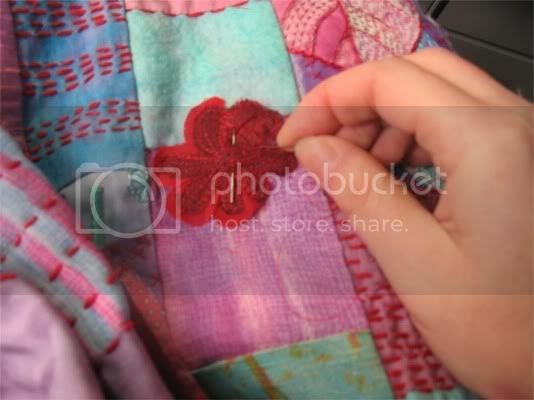 Well done on your flower quilt being featured on Etsy Finds! oh boy. Sorry to hear you're not feeling all that well yet. I bet this heat wave is just compounding it too... I always try to ask questions. It takes some of the mystery away and feels good to know I'm making a conscientious and educated player in the betterment of my health. I do love your colors, congrats on the feature. Sorry you are still sick from the meds....I have gotten very weary of medications lately. Get well soon! Great news about your featured item. Sorry you are unwell. Didn't know about 10 days in the system. Good to know. Feel better friend! What a pain! Get lots of rest and peace. And congrats on your item being featured! There is no surprise there, you are talented and your items are gorgeous! I agree with you on the importance of being our own advocate...here's hoping you feel better soon! awh I hope you feel better dear!!! Oh Victoria...I hope you feel better soon. On the upside the quilt is lovely. Congrats on the feature item! And hey! I live only about 30 minutes from Baltimore's Inner Harbor and not only have I never been to the American Visionary Art Museum -- but I've never even heard of it. Clearly I need to get out more!